The preferred cocktail mix of bartenders! Prepare cosmos perfectly in 3 easy steps! They couldn’t make cosmopolitans any more delicious but Bar-Tender's Brand has made it easier to make your own! 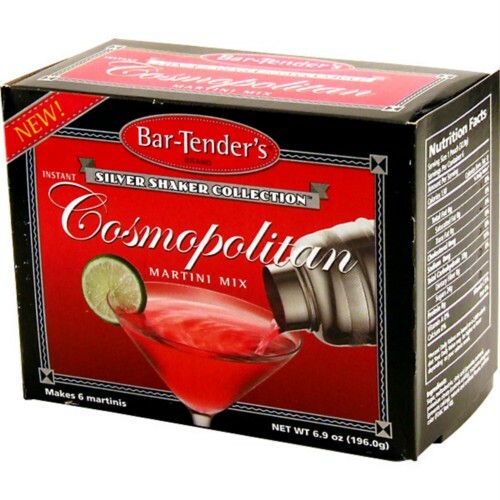 This instant cosmo mix makes awesome cosmopolitan martinis in three simple steps. Simply combine water, vodka and the contents of one of these pouches in a shaker, add ice and shake it up a bit. Strain the drink into your finest martini glass and garnish with a slice of lime and you’re ready to enjoy an incredibly classy cocktail, in minutes. With this cosmopolitan mix, you’re never more than a few moments away from your favorite martini. Each pouch makes 3.5 fl oz cocktail - Contains 6 Pouches per box. The perfect, easy to use mixer for your cocktail parties ~ 3 Simple steps to great tasting cocktails! Professionals agree - Bartender's is the preferred cocktail mix!